Stroke 29, Empowered Products' premium cream lubricant, is designed to take masturbation to a whole new level. Unlike Silicone- and water-based lubricants, this thick, non-greasy formula provides more than just wet slipperiness. As the cream heats up from repetitive stroking of masturbation, the product texture transforms at or around the 29th stroke to simulate the sensation of aroused human tissue. With the combination of heat and friction, a guy might actually forget he's using his own hand. The product's viscosity stays intact and doesn't break down during its transformation, so there is no need to re-apply. 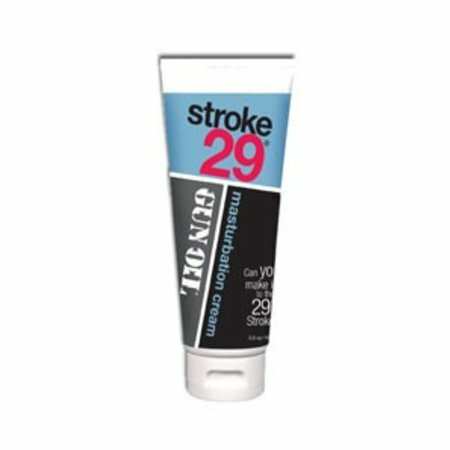 Stroke 29 is fragrance- and irritant-free. Available in a 3.3 oz squeeze tube or sample pillow pack. Made in the USA. Stroke 29 is oil-based, so we do not recommend this lube for vaginal play. Oil-based lubes should only be used with polyurethane condoms as they are not latex compatible. Ingredients: Water, Octyl Palmitate (from Coconut Oil), Prusnus Amygdalus Dulcis Oil (Sweet Almond Oil), Emulsifying Wax, Aloe Barbadensis Leaf Extract, Cetyl Alcohol, Tocopheryl Acetate (Vitamin E), Propylene Glycol, Glycerin, Methyl Paraben, Propyl Paraben, Carbomer, Diazolidinyl Urea, Triethanolamine.